Recreational Areas on campus are limited. 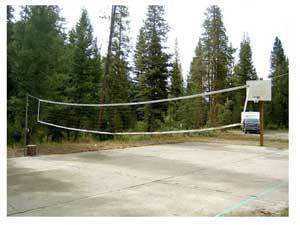 The basketball/volleyball court is an outdoor concrete slab located to the east of Hawley Lodge. There is a large meadow to the north, however, be advised this area is un-level and rocky. The Sawtooth National Recreational Area office has information on area hiking and biking trails. Horseback riding at the Galena Stage Stop Corrals is a 20 minute drive north on Hwy 75. Whitewater rafting is available in Stanley, about an hour drive north of camp. Redfish Lake, also an hour drive north, offers swimming, boating and hiking. Recreational shoppers will enjoy Ketchum’s multitude of shops, restaurants, movie theaters and galleries and the short 8 mile drive into town.